The Campaign for Peace and Democracy invites you to Washington, DC, on March 5 and 6 for the first-ever two-day Summit on Saudi Arabia and U.S.-Saudi ties. The summit is being hosted by CODEPINK, the Campaign for Peace and Democracy, the Fellowship of Reconciliation, The Nation Magazine, the Institute for Policy Studies, Peace Action, and many others. The new wave of hostilities unleashed by the Jan. 2 execution of prominent Saudi Shia cleric Nimr Al-Nimr shows how critical it is for us to understand the dynamics of Saudi politics and its effects throughout the Middle East. In an effort to keep this accessible to all, the price for the entire conference is only $20 to $100 (sliding scale), including lunch. And after you register, please be sure to let us know by replying to this email or contacting us at cpd@igc.org so we'll know to look for you in Washington. The conference includes a great line up of more than 15 speakers, including Saudi, Yemeni, and Bahraini nationals, talks by Medea Benjamin, Chris Hedges, Vijay Prashad, as well as Mohammed Al-Nimr, son of Sheikh Nimr Al-Nimr and representatives from Human Rights Watch, Amnesty International, the Gulf Institute, and the National Iranian American Council. This summit will address issues such as human rights, Saudi domestic and foreign policy, and the prospects for change inside the kingdom and in U.S.-Saudi relations. Want to learn about the roots and spread of Islamic extremism. Seek solutions to violence in the Middle East. Support a U.S. foreign policy that is based on respect for human rights. Are working to end our dependence on fossil fuels. At the Summit on Saudi Arabia, you will learn about a country that is a close ally of the U.S. government and business community but is at the root of many of the problems plaguing the Middle East. 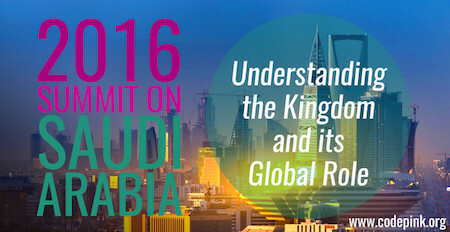 By attending keynotes, panel discussions and workshops by people who are from the region or have spent time there, you will gain tools and information to speak about these issues in your community and become an active part of a network of change-makers seeking to influence the nature of U.S.-Saudi ties. Just $20 to $100 sliding scale, including lunch. Don't forget to let us know when you register. And please join the Facebook event, where CODEPINK will be posting updates on additional speakers and co-sponsors!